HP is placing design front and centre as it looks to pivot from a tech company into a lifestyle brand. By Natalie Mortimer. Hewlett Packard (HP) is well known for its technical prowess. Founded by Bill Hewlett and Dave Packard in 1938, the tech company’s first product was an audio oscillator; an instrument used to measure audio frequencies. Since its release in 1939, HP has gone on to create a plethora of devices from commercial, consumer and notebook personal computers to handheld appliances. But as the relationship between people and their devices evolves into one that communicates style and personality, HP is keen to be seen in a new light. “By elevating design, what you’re seeing in the structure of the company and in the products that we’re now producing, is that HP desires a little bit of a different appreciation and a different image,” says Stacey Wolff, global head of design. 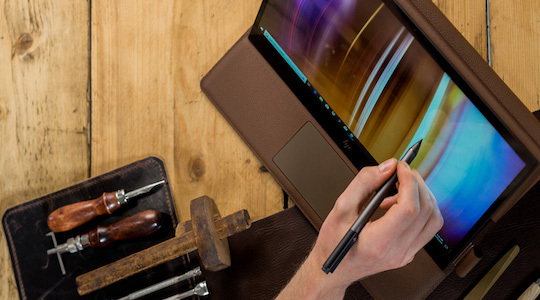 A prime example of this new direction comes in the shape of the recently launched HP Spectre Folio, a convertible PC that is made from one continuous piece of chromed tan leather. 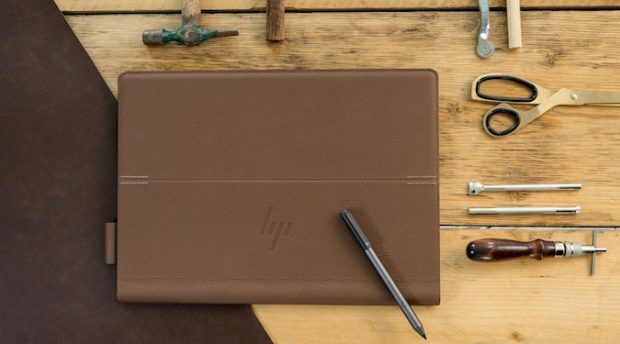 It’s a bold move for HP, which went through a process of “manucrafturing” to design the laptop, a word the brand defines as the place, ‘where meticulously designed hardware meets handcrafted materials’. “The word manucrafturing epitomises everything we went through during the manufacturing process that we typically see and associate with leather,” explains Wolff. “We went down a process that wasn’t natural for us, including patterning and templates. We basically retrained our product designers from CAD to go back and learn the leather craft. They went back to the beginning to go to the future. HP is not alone in its drive to focus on design. As our relationship with technology has become more intimate, many technology brands are shifting their positioning from utility to lifestyle. Google and Apple have both expanded into other industries, like fashion, entertainment and home appliances, with Apple partnering with high profile luxury brands like Hermès for the launch of its Apple watch. So does HP see a similar future where it strikes relationships with brands in the fashion industry, for instance? “I think that we have to prove ourselves first, in the sense of can we move into that space?” says Wolff. Natalie Mortimer is editor, Australian Design Review.